Take a tour with Whale Watch Kaikoura on the South Island and enjoy the fresh air of New Zealand while watching the magnificent marine mammals known as Sperm Whales. Aboard this whale watching tour, passengers that have come to see large species of whales known as the Sperm Whale, have their cameras clicking as fast as they possibly will go. Once these Sperm Whales surface, you must be prepared to capture their picture as you never know what these whales will do next and what you might miss if you turn away while out on a whale watching tour. Most people that board this boat at Kaikoura, New Zealand are here to see the Sperm Whales as these are the most common mammals seen all year round in this region. On a good day, you may get to encounter Sperm Whales, New Zealand Fur Seals, dolphins or the rare and unique Albatross bird. If you are out with Kaikoura Whale Watch at the right time of the year when the whales migrate, there is also the possibility of seeing Humpback Whales, Pilot Whales, Blue Whales and Southern Right Whales. The most popular whale is the Sperm Whale as they love to reside here throughout the year due to the three kilometer Kaikoura Canyon that runs along the coastline providing an excellent food supply for these whales. Looking at these incredible mammals at close range gives one a chill up and down your back due to the excitement you feel and the massive size of the whale. Some adult Sperm Whales have been known to be the size of four elephants. Sometimes a long tour is not necessary as the Sperm Whales tend to linger close to the shoreline which gives passengers aboard this whale watching tour more time to spend with them. Always be quick with your pictures, as a Sperm Whale has been known to be submerged for up to two hours if they are in search of a particular type of food. 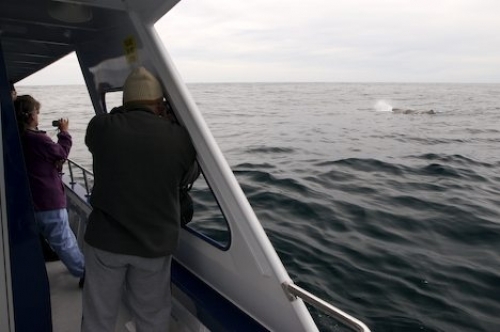 On a tour with Whale Watch Kaikoura, there is a guarantee that if you do not see at least one type of whale, your money will be eighty percent refunded. What more could you ask for while whale watching off the South Island of New Zealand and enjoying a trip of a lifetime.